I don’t really get into the commercialized Christmas–in fact, it’s definitely a bah humbug time of year as far as I’m concerned, but I do have some holiday traditions that I observe. As you might guess, food is involved in at least one of them. It’s not holiday time without oysters. On Christmas eve and for New Year’s eve or New Year’s day. This tradition goes back more years that I’ll admit–to childhood. 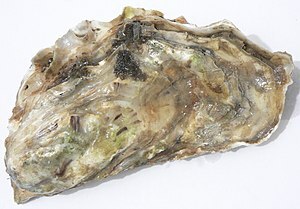 I’ll eat oysters almost any way you put them in front of me; the only way I don’t like them is overcooked–which happens all to often with oysters. So, I usually eat my oysters at home where I can cook them myself. My usual Christmas eve oysters are something that I learned from my grandmother–she called it oyster stew, but I soon learned that what she did was a far cry from what most people call oyster stew. I’d be reluctant to consider eating oyster stew at most restaurants. I’d be expecting (and probably get) a bowl of milk and perhaps, with luck, an over-cooked oyster or maybe three, and those weird little crackers. I guess I really shouldn’t call what make for myself oyster stew–there are way too many oysters and not enough milk–it’s really just some oysters poached very gently in cream with some seasonings. One of my holiday rituals is deciding what I’m going to use for seasoning with the oysters this time around. Although oysters, cream, a black peppers, and a bit of salt is always good, it is fun to try different combinations. I’ve use chilli peppers to spice things up a bit, or Pernod and/or fennel with oysters. I still have a few days to decide what it will be this year. While I’ve been skulking about the web looking for unique ideas, I found a delightful blog that I need to share with other oyster lovers out there: The Oyster’s my World. There is a great list of informational books, websites, and even oyster-related apps here–a good starting place if you wish to explore the world of oysters. Now, back to the web to “design” the oyster dish for this Christmas eve, and to select an appropriate wine. Thanks for your words of appreciation!